We all probably know someone who has been deeply affected by breast cancer. While breast cancer remains the most common type of cancer diagnosed among women, there are millions of survivors living in the United States. Many of them provide support, hope, and encouragement to newly-diagnosed patients. In May, the FDA approved an immunotherapy (pembrolizumab) for any "unresectable or metastatic, microsatellite instability-high (MSI-H) or mismatch repair deficient (dMMR) solid tumors that have progressed following prior treatment and who have no satisfactory alternative treatment options." 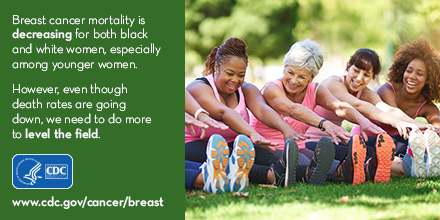 CDC launched Bring Your Brave in 2015 to provide information about breast cancer to women younger than age 45. The Bring Your Brave campaign provides information about breast cancer to women younger than age 45 by sharing real stories about young women whose lives have been affected by breast cancer.